Let’s talk about a delicious thing you can do with a lot of gin – Vanilla Gin Extract. Wait…stay with me. It’s not that imitation vanilla extract you once drank on a dare. This recipe is easy, but takes some time – 8 weeks minimum. Make fancy holiday presents for people, or something that will set your cocktails above all those other basic cocktails out there. You can also use it in any recipe that calls for regular vanilla extract – cookies, ice cream, pancakes, etc. Now – the gin you pick for this will be important. I tested this out with a lovely aromatic gin (Greenhook Ginsmiths) and a strong navy strength gin (Perry’s Tot). Greenhook Vanilla Infused Gin had a delicate flavor in addition to the rich vanilla from the beans. It would be best in things that you wanted to flavor but not cook – whipped cream, chilled cocktails, icings. Perry’s Tot, meanwhile, had a robust flavor that stood up well in items that took a little bit of heat – cookies, cakes, meringues, hot toddies. Glass jar with tight lid – Do not use plastic. The results will be vile and possibly very bad for you. Take the vanilla beans and slice them open length-wise. Put the sliced vanilla beans into the glass jar. Pour in some gin. You want to cover the beans at minimum. Screw the lid on tight and give the mix a shake. Put the jars in a quiet, dark place. Maybe with the potatoes that you forget about in the back of the cupboard. Maybe shake it up every once and awhile, why not. Wait eight weeks. If you’re planning on making a huge batch, you can slice open at least three big vanilla beans and pop those right into a bottle of gin and you don’t have to fuss with the jar and pouring. The result is a rich, complexly-flavored vanilla concoction. You can use this as you would use vanilla extract in any recipe. You can also drink this on its own! 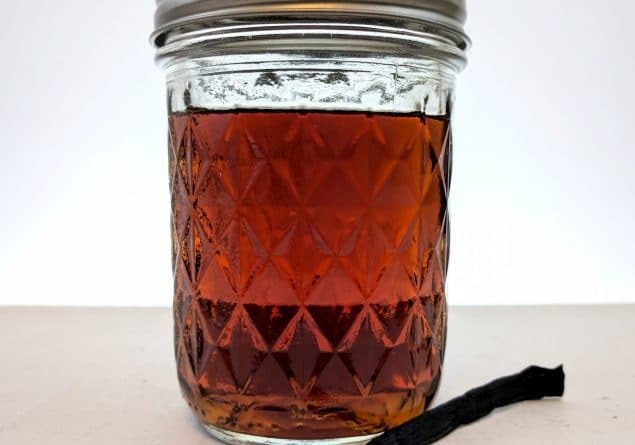 It’s certainly vanilla-forward, but you can use this to liven up cocktails, make soothing summer drinks, or rich and warming hot toddies in addition to cooking and baking with it. ← What is London Dry Gin?